#RPGaDay2015 Day 4 Most Surprising Game. I am going to have to go way back for this one. In the early 90’s the majority of the games I knew of was just TSR products. I had run the gambit of D&D, Dark Sun, Gama World, Spell Jammer. I had just recently found that Battletech had a RP system called Mechwarriror and It fell flat for me. I began looking into traveler and shortly after I joined the Military. 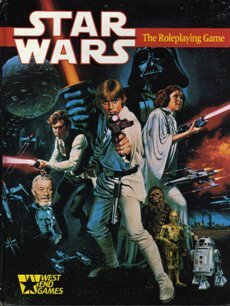 Joining the military for me opened me up to a universe of RPG Games in short order. In my Duty station Gaming was a huge hobby and the variety of games was far and wide. Then I stumbled on what would become one of my deepest loved RPG games of all time. Here was the combination of two of the most loved things that I knew of up until that point in my life. Star Wars was everything that encompassed my early years. I had every toy, I pestered my parents and did chores or what ever it took to get all things Star Wars. Even to this day Star Wars holds a huge place in my heart. Roll that into an RPG game. Suddenly the little boy in who had played out the battle of Hoth in the frozen wastelands of Wisconsin could continue his childhood quest at the RPG table. I was all in and never looked back. Previous post#RPGaDay2015 Day 3 Favorite new game of the last 12 months?